DETROIT (CNS) — Msgr. Anthony Figueiredo’s mission to the United States is of the utmost importance to the Vatican: to be the pope’s ears on the ground. Visiting the Archdiocese of Detroit for the annual Holy Trinity Apostolate Lenten Symposium March 11, Msgr. Figueiredo’s role in the Vatican’s Migrants and Refugees Section of the Dicastery for Promoting Integral Human Development means he has the task of speaking with local bishops and Catholic leaders about what is being done, and what more can be done, in support of refugees and immigrants seeking safety in the United States. The new dicastery was formed by Pope Francis Aug. 31 and took effect Jan. 1, bringing together the pontifical councils for Justice and Peace, Cor Unum, Migrants and Travelers, and Health Care Ministry. Msgr. Figueiredo said the councils were combined to create the new dicastery to answer to the needs of thousands of migrants, refugees and victims of human trafficking, who are being forced from their homes. Msgr. Figueiredo cited a U.N. report stating there are as many as 78 million refugees in the world today, and as many as 244 million migrants and refugees all together. While much attention has been paid to President Donald Trump’s immigration and refugee policy, Msgr. Figueiredo said the issue is “a major phenomenon” in the world. Msgr. Figueiredo’s visit to the Archdiocese of Detroit is the first of many he is taking around the world, meeting with local Catholic leaders about what support the Vatican can provide for refugees, which Msgr. Figueiredo said is one of the biggest issues in Pope Francis’ pontificate. Before the Lenten Symposium, Msgr. Figueiredo met with Jason Shanks, CEO of Catholic Charities of Southeast Michigan, and Detroit Auxiliary Bishop Arturo Cepeda, who a week earlier had hosted a gathering of organizations that resettle immigrants and refugees. While visiting the Catholic Charities location in Pontiac, Msgr. Figueiredo met with families from Syria and Iraq who were resettled by Catholic Charities. Msgr. Figueiredo said he discussed with Shanks how Trump’s temporary ban on refugee resettlement — currently blocked by the courts — could affect the finances of Catholic Charities, as the agency receives federal grants to resettle newcomers. He also praised the leadership of Detroit Archbishop Allen H. Vigneron in speaking on behalf of immigrants and refugees in southeast Michigan. Msgr. Figueiredo said he and others in his department are well aware of the economic and security fears governments might have in accepting refugees and immigrants, but that is no excuse to abandon the Christian message of welcoming the stranger. With all the fear and negativity surrounding the issue that seems to dominate the news cycle, Msgr. 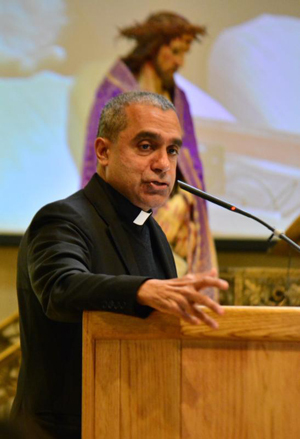 Figueiredo said the most important thing Catholics can do is stick to the core principles of loving one another and placing trust with God, even when the debate about the country’s next steps seems tense. Meloy is a staff reporter at The Michigan Catholic, newspaper of the Archdiocese of Detroit.